1. A cat vaccination schedule, unlike ours, requires many vaccines to be administered annually. This is because cat vaccinations are not put through the same expensive tests that human vaccines are to guarantee lifelong efficacy. Sticking to this schedule is very important because of this. 2. The feline distemper vaccine should be given to handfed kittens after 12 weeks and kittens that have weaned from their mother’s milk. It is possible for the vaccine like properties of her milk to cause the vaccine to be ineffective. Because every cat will be exposed to this disease eventually, this is a very important vaccine. 3. The feline leukemia vaccine should be administered only to cats at a high risk of infection, such as outdoor cats. Although the highest cat mortality causing virus, feline leukemia is caught only through direct contact. 4. If you skip a year of the feline infectious peritonitis vaccine, the schedule should be restarted altogether for proper efficacy. Parvovirus, distemper, and Bordatella vaccines can be continued normally. 5. Live, or modified, vaccines should never be given to a pregnant cat. The weakened strain can still infect the kittens. Only killed virus vaccines should be used. 6. Cat vaccinations are considered over the counter, so it is possible for you to administer them yourself. This is not recommended since proper vaccine storage is essential to efficacy, and adverse reactions will need immediate medical care. 7. 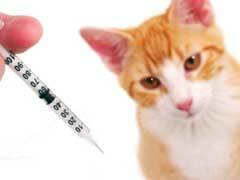 Cat health insurance that will help pay for these vaccines is available and fairly affordable. 8. Cat vaccinations come with risks, but these risks are far outweighed by the benefits. Please, vaccinate your animals. 9. Always be sure your pet is tested for the disease they are to be vaccinated for, vaccinating and infected animal can greatly exacerbate the illness. 10. Although many diseases have been made rare by vaccines, it is still important to continue vaccination. This will ensure they stay rare.